"Your position is no longer available" - the PC way of telling folks they have been terminated in the gloriously good 'Up In The Air', the film to beat come Oscar season. Director Jason Reitman (Juno) has captured a living, breathing snapshot of now - a time when your livelihood has never been so precarious. In a performance that is a virtual lock for a Best Actor nom, George Clooney absolutely owns his execution-squad-of-one role, Ryan Bingham. 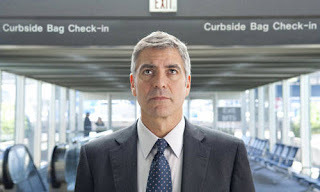 Clooney takes the best of his characters from Michael Clayton and Ocean's Eleven and welds them into one that lives life to its' sleekest and simplest. This is a guy who's only distraction is returning home after being on the road 322 days a year. But it's his new partner in corporate-downsizing, Natalie (a fantastic Anna Kendrick) that causes Clooney to rethink his way of life. Where once a life of detachment seemed ideal, Clooney comes to the slow realization that some kind of connection might actually be a good thing. Enter Alex (Vera Farmiga in her own Oscar-caliber performance), a woman with pretty much the same DNA as Clooney's - their shared goal in life is to accrue the most frequent flyer miles humanly possible. Just as the pair become more and more intertwined, Reitman pulls the rug out from under you; a twist that proves this is not your run-of-the-mill, let's wrap-this-thing-up-with-a-tidy-little-bow Hollywood flick; and that is a very good thing. And that's what makes 'Up In The Air' such an achievement - an "accessible-indie" film that leaves you more alive walking out than you were coming in. A movie that defines now - jobs eliminated - folks living in fear, afraid they'll be next - watch your back because no one else is. For Clooney and crew, what should be a trip wallowed in depression, instead becomes one you will be more than glad you took your seat for.